Regenerative medicine offers much promise for those suffering from several disease states. It is a method of using our own natural healing properties in living a better quality of life. Stem cells are presently the largest target in the regenerative medicine area. Stem cells are naive cells that have the ability to divide indefinitely. They may functionally change into any cell in our body and can integrate to the target tissue, either in the presence or absence of damage. Stem cells are "undifferentiated" cells, which allow them to develop into another type of cell that is required to repair or replace damaged tissue. Stem cell therapy can repair tissues that are too damaged to heal on their own. Stem cells can stimulate the formation of cartilage, tendon, ligaments, bone and fibrous connective tissue. Stem cell therapy is in the spectrum of cutting-edge therapeutic techniques used to naturally treat and heal the cause of a painful condition rather than masking the symptoms. Stem cell therapy stimulates and accelerates your own body's natural ability to heal itself. Osteoarthritis is the most common cause of chronic joint pain. Osteoarthritis involves the entire joint, including the nearby muscles, underlying bone, ligaments and connective tissue. In osteoarthritis, the supportive tissue called cartilage degenerates, leading to inflammation and pain. This type of arthritis is common in shoulders, hips, knees, hands and feet. Patients will often complain of joint stiffness, throbbing, and swelling. There is no cure for osteoarthritis, but regenerative medicine therapies such as stem cell therapy is a new generation of treatment that has been proven to be safe, effective, and have lasting results. Rethinking and evolving science using cutting-edge technologies have led to the most potent and vibrant form of stem cells – umbilical cord blood-derived cellular allograft tissue. Umbilical cord blood contains a beneficial blend of cytokines, growth factors, and stem cells that ensure a rich microenvironment to foster tissue regeneration and cellular growth. Cord blood regenerative medicine products contains primitive undifferentiated stem cells and additional growth factors which are beneficial for repair, growth and healing. The release of growth factors that aid in the formation of new blood vessels, activation of endogenous stem cells, modulation of the immune system and growth of cells and tissue. In stem cell therapy, new stem cells are introduced into the body, and their capacity to differentiate or turn into specialized cells may allow them to repair diseased or injured tissues. They also proliferate or renew themselves many times, which can provide an ongoing supply of healthy cells. Stem cells are "intelligent." They can move through the body to where they are needed and communicate with other cells. Research indicates that mesenchymal stem cells may offer other important therapeutic properties including immunomodulation, anti-inflammatory functions, infection-fighting properties and cell rescue actions. The array of benefits related to umbilical cord blood-derived allografts is supported through the successful transplantation and coordination of multiple components. There is a careful orchestration of the ratios of cytokines, growth factors, exosomes and stem cells naturally occurring in umbilical cord blood. This naturally occurring balance of cytokines and growth factors make umbilical cord blood a great resource for allograft tissue geared towards bone growth and tissue regeneration. Umbilical cord stem cells contain mesenchymal stem cells (MSCs). They come from safe, reliable hospital sources via a non-invasive, simple, and painless procedure. The cord blood fluid allograft tissues are procured through fully tested and consented donors. Every donor is subjected to comprehensive infectious disease panels that surpass federal and industry standards, ensuring safe allografts. Umbilical cord-derived mesenchymal stem cells are provided by hospitals. All donated cord blood is delivered directly to the lab for production. As no potentially risky or painful surgery is required, extraction of umbilical cord blood is the least invasive and safest option of sourcing stem cells. Research has shown the cord blood stem cells are not susceptible to malignant transformation in a serum-free medium, making them safe for therapeutic use in patients. The stem cells are screened in compliance with FDA, cGMP (Current Good Manufacturing Practice) standards, which regulate quality and safety in the production of medication. Cord blood stem cells are strictly screened, high-quality, and sold in standardized concentrations. Using stem cells gives patients a wide range of benefits via therapies that can be conducted in under half an hour. Cord blood consistent concentrations allow for multiple administration in uniform, high cell count doses. Patients can enjoy safe, non-surgical treatments in the same amount of time it would take them for a traditional office visit. 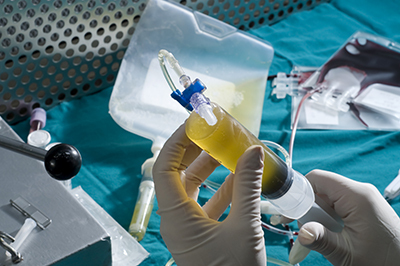 Regenerative therapy procedures are performed as outpatient procedures. They involve an injection of concentrated stem cells to regenerate and heal tissues in joints, muscles, tendons, or ligaments. These therapies can be used to treat acute or chronic pain conditions related to a degenerative disease. Stem cells are shown to be capable of accelerating the healing process. In summary, cord blood stem cells, a regenerative medicine product, is one of the most unique stem cell/regenerative medicine products that exists today. Cord blood stem cells contain many factors that repair and heal various trauma and diseases. Cord blood stem cells play a role in angiogenesis, growth and repair of cartilage and bone tissue, which serves well in orthopedic disease, and a wide array of autoimmune diseases. Will cord blood stem cell therapy help my knee, hip, foot & shoulder pain? With a third of the US suffering from chronic pain, and over a million each year undergoing joint replacements in the US, stem cell therapy has the potential to reduce or eliminate your pain and increase your mobility. Some patients experience a huge reduction in pain within weeks of one injection. Previous treatments have included steroid injections, opioid (narcotic) pain/non-steroidal anti-inflammatory medications and even joint replacement. Stem cell therapy has the potential to repair fibrous connective tissue and stimulate the formation of cartilage, tendon, ligament & bone. Cord blood stem cells not only promotes long-term pain relief but a significant restoration of normal functions. How do cord blood stem cell injections work? Cord blood cell injections offer the ability to potentially repair and heal damaged tissue naturally. Stem cells may repair the body by dividing to replenish cells that are damaged by disease, injury, or normal wear. The array of benefits related to cord blood is supported through the successful transplantation and coordination of multiple components. Umbilical cord blood contains a beneficial blend of cytokines, growth factors and stem cells that ensure a rich microenvironment to foster tissue regeneration and cellular growth. Your body has the natural ability to heal itself with stem cells and other derivatives. As you get older, the number of stem cells you have in your body are greatly reduced and are not as efficient. Stem cells have emerged as a key element of regenerative medicine therapies. They also have immune-modulation properties which are very helpful in controlling pain & inflammation in the body. Regenerative medicine therapies include natural healing properties, reduces pain & inflammation, increase blood flow, minimally invasive, outpatient treatment, no downtime, non-steroidal, safe and effective, promotes soft tissue growth, and no adverse reactions. What benefits does cord blood stem cell therapy offer? Stem Cell therapy is an option for those looking for an alternative to surgery or potentially total joint replacement. Regenerative medicine and stem cell therapy allow a human body to naturally heal. It stimulates healthy cell growth and regenerates healthy tissue. Stem cell therapies have a multitude of growth factors producing cells. Growth factors are proteins naturally found in the body that promote the growth of cells and tissues. Stem cell therapies also use interleukins anti-inflammatory that reduces swelling and inflammation. Regenerative medicine therapy can potentially stimulate your body’s own stem cells to proliferate and target damaged cells in your body and repair or replace them. Want to avoid surgery and downtime? Do you suffer from back pain, knee injuries, knee pain, osteoarthritis, tendon/ligament/cartilage tears & injuries, muscle tears, arthritis, back pain, golfer's elbow, tennis elbow, joint injuries, hip pain, shoulder pain, rotator cuff injury, carpal tunnel syndrome, and plantar fasciitis? Then regenerative medicine therapies may be an option for you! Are cord blood stem cell injections safe? Cord blood stem cell therapy is extremely safe and effective. The injections/therapies have been used more than 60,000 times in the United States with no reported adverse side effects and with 100% safety record in Europe with 100,000 patients treated. Every donor is tested under infectious disease panels that surpass governmental standards. All cord blood stem cell donors go through a rigorous screening process, as determined by the Food and Drug Administration (FDA) and the American Association of Tissue Banks (AATB). Furthermore, cord blood stem cells are fully documented, and screen tested thoroughly according to FDA's registry requirements. This ensures the optimum quality and potent stem cells for a premium application. Regenerative medicine therapies are non-surgical procedures that take a minimal amount of time, faster recoveries, completely natural and no need to take pain medications. Regenerative medicine therapies use stem cells and their derivatives to help heal, regenerate tissue and decrease inflammation to improve your quality of life. You may be a good candidate for stem cell therapy if you have been suffering from joint pain and want to improve your quality of life while avoiding complications related to invasive surgical procedures. Regenerative medicine is now the easiest non-invasive method to improve your quality of life. Patients suffering from knee, hip, shoulder, joint pain, etc. may be considered as candidates for cord blood stem cell therapy. If you have already tried conventional treatments, including steroids, narcotic pain & anti-inflammatory medications, etc. Stem Cell therapy is a safe and effective option. Call to schedule a consultation to determine if cord blood stem cell therapy is right for you. What conditions does Dr. Borenstein treat with stem cell therapy? Stem cell treatment at Manhattan Integrative Medicine is a simple, in-office procedure. Preceding your stem cell injection, you will meet with Dr. Borenstein to discuss your medical history and treatment expectations to determine whether or not stem cell therapy is a suitable for your condition. If he determines that it is, Dr. Borenstein will gently and strategically inject umbilical cord cells into the pain-causing regions of your tissue. Your joint may draw the nutrients into itself, where the stem cells and growth factors may potentially signal your damaged cells to regenerate. Full regeneration may take several months. Results will vary depending on your age, general health, pain level, diet, lifestyle and aftercare. Whether you need ACL injury treatment, arthritis knee treatment, or just want to get out of your runner’s knee brace – cord blood therapy may be your most effective, least invasive treatment option. Looking for a potential alternative to risky, costly surgery? No more need to google: “What is the best medicine for arthritis?” Manhattan’s top holistic doctor will work tirelessly to reduce your pain and inflammation, while striving to improve your range of motion and function. Of all the stem cell centers in New York State, Manhattan Integrative Medicine gets the most heartfelt stem cell therapy reviews. Write the next one. Schedule a consultation with Dr. Borenstein today by calling (212) 262-2412 or contact us here. Stem cell therapies have great potential in treating a range of chronic conditions. This site serves to inform patients about stem cell regenerative medicine, the BioGenix stem cell product, and key in vitro, animal model, and clinical research studies that have been carried out to date across medical specialties and health conditions. However, stem cell medicine is an early and evolving field, and clinical studies are still insufficient to determine effectiveness. Patients interested in stem cell therapy in the U.S. are advised to consult a physician about the state of FDA approval for any given product and/or inquire about opportunities to participate in a clinical trial. Patients interested in stem cell therapy outside the U.S. should investigate regulations in the specific country. It is important to be aware that regulations and clinical study requirements vary from country to country.